It often comes down to where and how these crops are grown, and what else is nearby. When you hear news about about avoiding certain foods contaminated by dangerous bacteria, chances are good it will be lettuce. The FDA says about one in five outbreaks come from leafy greens, more than any other crop. But what makes them so vulnerable? These plants grow their broad leaves close to the ground. If a field is irrigated with contaminated water or floods after heavy rain, the risk of contamination increases. In some recent cases, there have been livestock just upstream, too — and runoff from cattle farms can be loaded with E. coli bacteria. It's also hard to treat lettuce or spinach after it's been infected. Leafy vegetables are often consumed raw, and washing their leaves isn't enough to guarantee they're free of pathogens. The best way to stay healthy during an outbreak is to follow guidance from the CDC or FDA and be ready to skip that salad if you have to. 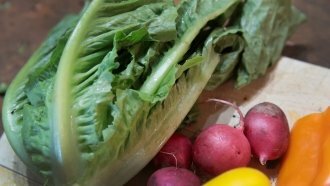 Once officials determine the severity of an outbreak, they may issue recalls, recommend avoiding certain food suppliers or tell you to toss that lettuce out right away.